BioWare has announced Leliana's Song, the next DLC release for the hit RPG Dragon Age: Origins. Leliana was hot stuff. 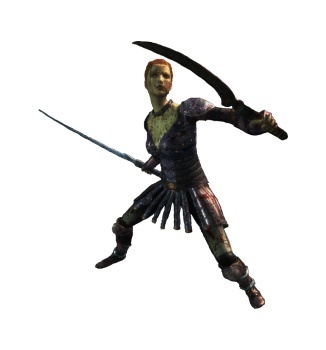 She was cute, built, handy in a fight and had the sexiest accent this side of Oghren. I hitched my wagon to Morrigan's cart (with a quick detour through Zevrantown) so I was never able to delve into her Deep Roads, but soon, thanks to the magic of DLC, I'll at least be able to delve into her mysterious past. In Leliana's Song, players will step into the boots of the red-headed Orlessian bard and occasionally self-righteous Chantry flunky who plays a central role in Dragon Age: Origins. The DLC package will "explore Leliana's dangerous past and why she joined the Chantry" as she accompanies her mentor Marjolaine on a high-risk mission with only one outcome: Kill or be killed. The fully-voiced update will also feature a unique, unlockable reward that can be used in Dragon Age: Origins and the expansion Awakening. Leliana's Song is scheduled for release on July 6 for the PC, Xbox 360 and PlayStation 3, and will retail for $7. Check out BioWare's Dragon Age website to learn more.